Is that a red-tailed hawk or bald eagle I hear? So this weekend while hiking in Marin I heard a red-tailed hawk screech in flight. I was under the trees so I couldn't see it, but I knew it was a red-tailed hawk because last week I went to the Lindsay Wildlife Museum in Walnut Creek. It's also a wildlife rescue center for native California animals, so they had many animals, mostly raptors, that had been injured at some point. A disturbing number of them had had a wing amputated, but they seemed pretty active all the same. The coolest animals there were probably the bald eagle and the bobcat. I hadn't ever seen either of them up close, usually off in the distance and not for very long. Both were much bigger than I expected and were incredibly beautiful. The bald eagle started making some sounds which sounded nothing like what I expected the eagle to make. You can listen to a sample here if you give it a second to load. Much higher pitched than I thought. The docent noticing our surprise said that Hollywood had decided this was not a proper sound for a bald eagle and whenever they wanted to add the sound effect they used the cry of our own red-tailed hawk. You can find a sample here. One good thing to learn was that there are a few breeding pairs here on the edges of the Bay Area. One pair I remember is in Livermore. And more come for part of the year. So, I only had time to see 3 gardens and drive past one more on the tour. I had the same experience as last year. Some are beautiful gardens using native plants. Others, as my friend put it, seem like a random assortment of native plants. To each their own. One I really liked was David Loeb's garden in Berkeley, especially the backyard. A creek runs through the back of his property and you could see how all the neighbor's creeksides were masses of ivy and other invasive, noxious plants. 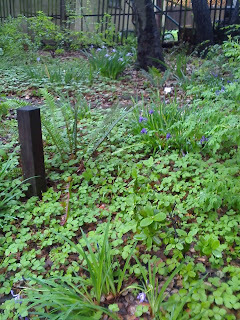 This garden actually cleared all that out and had native plants spilling over the banks in the shade of massive oaks. Looks like something I might see hiking. What I liked about the backyard was it's incredible simplicity and lush greenery. The three main plants (besides the oaks) were a carpet of native strawberries (fregaria vesca), snowberries nd other berries for some height, and, every so often, douglas iris for a different texture and, in this season, beautiful blooms. 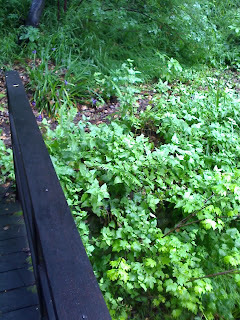 There were other natives as well to provide diversity, such as ribes sanguineum, sticky monkeyflower, ferns and rushes. A great, beautiful space.